What kind of gift does this grad really want? Yes, you could go the route of a quick card and some cash, the polite way of saying “How do I know what you want? Buy your own gift.” For some that may work just fine, for others teetering on the line of wanting to get something “helpful” but also not knowing them well enough to know exactly what the grad wants can be a challenge. 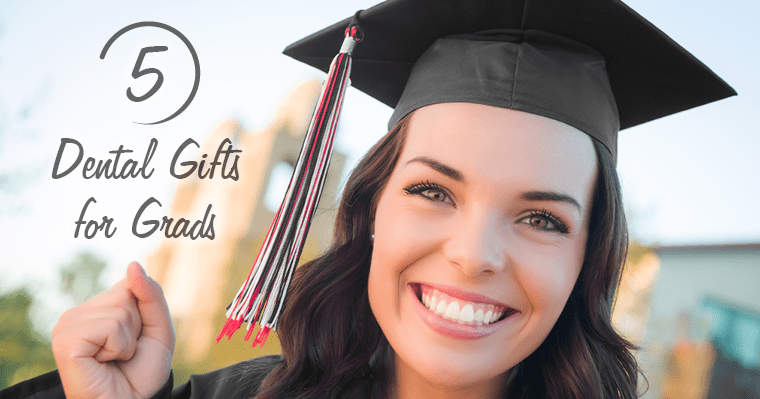 In the spirit of graduation season, we thought we would share five great go-to dental-related gifts ideas for grads. Plus, each of these gifts will benefit their health, appearance, and overall well-being. This beautiful gadget is amazing for your precious family or friends who value perfect teeth but aren’t prone to (or don’t enjoy) flossing. A Waterpik or (water flosser) takes away the stringy mess and cleans between teeth using water pressure to dislodge unwanted plaque and food. Also, the “fresh and clean” feeling you get at the end is always a bonus! A Sonicare toothbrush is an electric toothbrush that vibrates at 30,000 to 40,000 strokes per minute. A Sonicare or other electric toothbrush can clean areas that a conventional toothbrush simply cannot. This allows you to enjoy a better smile and a healthier mouth. If you know someone who values their teeth and oral care, a Sonicare toothbrush is a perfect gift! Protecting a smile can be just as important for an athlete. Will your graduate be continuing on with college sports? Perhaps a customized mouth guard will help them keep their “game face.” Protecting pearly whites with a custom-fit mouth guard will give him or her the confidence essential for any successful contender. Give the gift of confidence! We suggest giving a certificate for an in-office whitening treatment or professional take-home whitening trays. These both trump the over-the-counter options and leave teeth looking amazing, brightening the entire smile! Helping teeth stay as pristine as the present you just got them, toothbrush sanitizers are outstanding bacteria-killing tools perfect for anybody. There are a number of types and models, so take a look and consider what may be best. Does this graduate love to travel? Perhaps he or she is going to study abroad? Consider a convenient clip-on toothbrush sanitizer. Do you have any other gift ideas for grads? Share them in the comments below!